What scares dirtbags? Global warming? Nine to five? Johnny Law? The unequivocal answer – bears. After sifting through the entries for the “Night of the Living Dirtbag,” it became clear – bears scare the daylights out of you all. To celebrate Halloween, we bring you two tales of terror. Contest winner Chris Peters explains why it pays to listen to the safety talk and a very special guest remembers a family vacation to the Alaskan wilderness gone wrong. Fear is a funny thing. Whether the threat is real or imagined, the emotion of fear – heart-pumping terror – is just as powerful. Fitz is always looking for great stories to feature on the show. 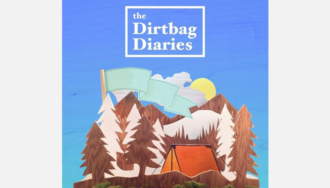 If you’re a climber, skier, surfer, activist or anybody who can’t get enough of being outside, consider sharing your story at www.dirtbagdiaries.com.